Had a great weekend with family in 2012! On Wednesday went shopping for bread and pies. Had a good Thanksgiving lunch with lots of good food. There was cranberry sauce, stuffing, mashed potato, green bean casserole and stuffed pumpkin. Apple and pumpkin pie for desert. I found a new good recipe for stuffed baked pumpkin. It would have been a keeper, unfortunately I bookmarked it instead of writing it down and the website took it down. After lunch had family time chatting and laughing. In the evening played Apples to Apples. It was a lot of fun. Went out to Michaels to shop for some frames and matts using their 30% off coupon. Friday was hectic. Saturday after lunch guests left. A very relaxing weekend. We did not have family visiting in 2011. It was just us. I did not try anything new. We were really thankful to be celebrating Thanksgiving in our new house. We celebrated Thanksgiving 2010 with family in an apartment that we had moved into just over a month earlier. Cooking in a tiny apartment kitchen was crazy and took forever. We had lunch at 4pm. But we had a good time with family visiting. It was a sad Thanksgiving in 2009 and we were grieving. My mother had passed away. It was just the two of us, my and daughter and I in the house. The only reason I had the annual spread was because my daughter insisted on it. Glad I listened to her. It felt good reminiscing. A look back at our 2008 Thanksgiving table. The cranberry sauce, green bean casserole and mashed potatoes were all there. Tried a few new ones including stuffing. This is our Thanksgiving table from 2007. The recipes are all vegetarian. Some made at home and some are store bought as I learned new recipes every year. When I found one everybody liked, it went into the keeper file to be repeated the following year. In 2006 my daughter asked if we could celebrate Thanksgiving with a traditional meal. Thanksgiving had to be vegetarian but I liked the idea of serving in season ingredients and having a meal as a family being thankful for everything we have. Now the year before I had tried my hands at pumpkin pie but I did not really make anything else. This was our first Thanksgiving meal. This recipe was given to me by my sister. 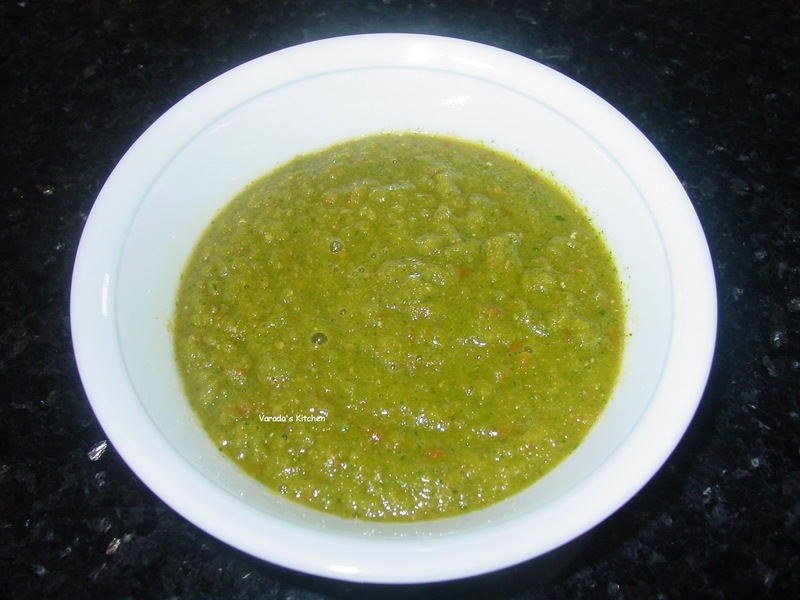 It is a healthy alternative to the coconut chutney and just as flavorful. Grind all the ingredients into a thick paste using a blender. Use a couple of tablespoons of water if required. Poli is the stable of the Indian diet. Whole wheat flour available at Indian Stores. You can make about 6 polis per cup of flour. Using water make firm dough with one cup of water. Knead the dough well. Pour a teaspoon of vegetable or olive oil on your palm and knead the dough again. Let it rest for 15minutes. Heat a flat pan on medium-high heat. I used to have a smooth top stove so I used another burner with a cooling rack on it. If you use a gas stove you don’t need to use a second burner. Divide the dough into 5-6 small balls. Using a little flour, roll one of the balls of dough into a flat circle about 8inches across. Place on the hot pan. Let it cook on side A for about 15 seconds and turn over. Let it cook on side B for 1/2 a minute. Then place the poli, side A face down on the second burner. If you are using a stove top remove the pan from the stove and place the poli directly on the burner. Either way it will puff up in a couple of seconds. Take it off the heat and proceed with the rest of the polis. Serve hot or keep covered until it is time to eat. 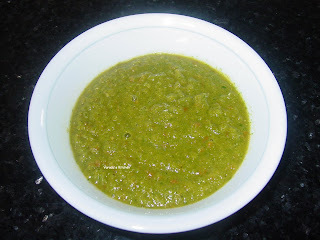 In a blender blend the onion, tomato, coriander leaves, coriander and cumin seeds, turmeric powder and the garlic paste. It will look like this. Slit the beans lengthwise and then chop into 1 inch pieces. Heat a saucepan on medium heat. Add olive oil and mustard seeds. 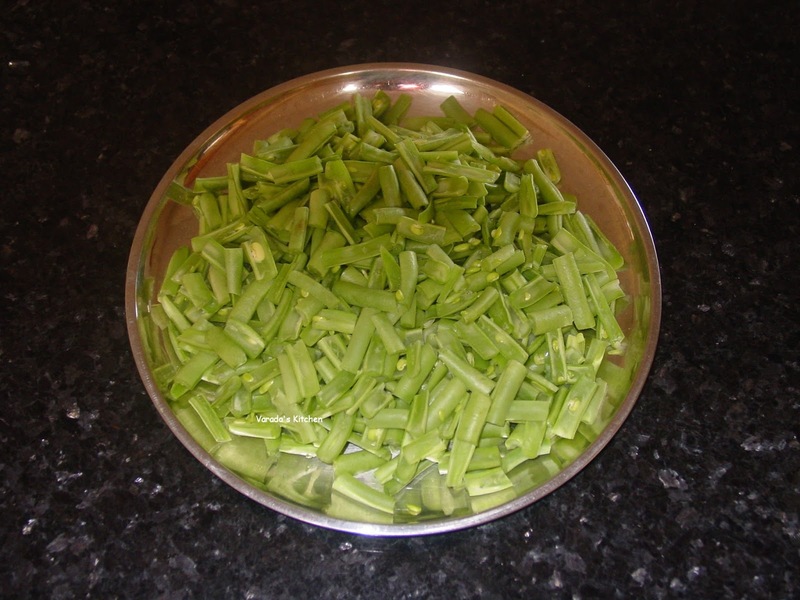 Once the seeds splatter, add the asafetida and the chopped beans. Sprinkle some water and cook the beans covered until tender, about 5 minutes. Add the masala (curry) paste and cook until the water evaporates. Serve hot with poli (flat bread). 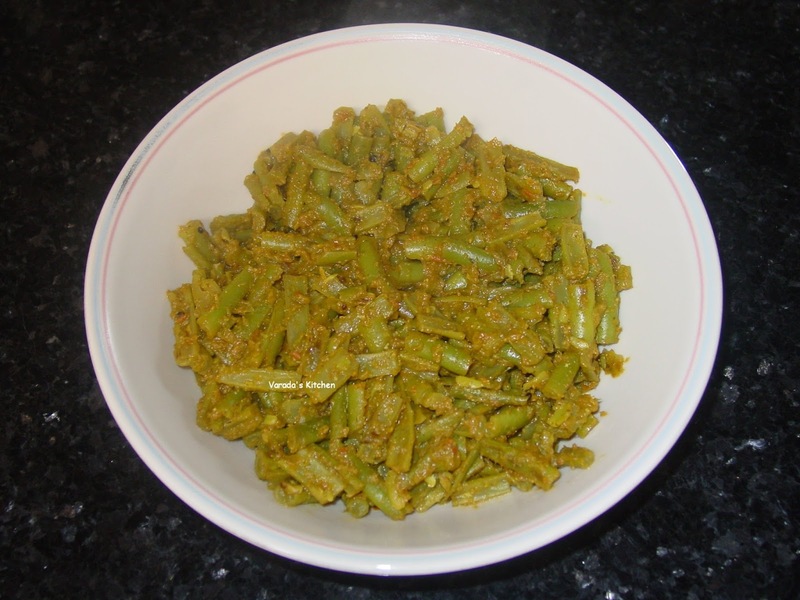 Faral or special food cooked during festivals. A collection of authentic Maharashtrian dal, Kadhi and usal recipes. A collection of authentic Maharashtrian bhaajya. A collection of authentic Maharashtrian koshimbirs. A collection of authentic Maharashtrian chutneys and pickles. A collection of authentic Maharashtrian side dishes. Bread leavened with yeast has been baked for centuries. This section is my humble collection of bread baked in my kitchen. All the recipes posted under this section are leavened with yeast except the misc breads which use baking soda. Some of these are traditional breads I have carefully tried to recreate, the others are my own creation. Parathas are flavored Indian flat breads. They are quick and easy to make. They taste best when hot but retain the flavor even when cold making them perfect food for a packed lunch. Parathas are my favorite go to recipes on weekday mornings. I have a very wide ever growing collection of parathas on this space. A collection of poli or roti or chapati. 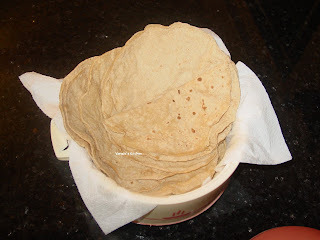 A collection of different types of bhakri and thalipeet. Bhakri is a flatbread flattened by hand. It is not rolled out. It is usually made with flours that do not lend themselves to be rolled out. Thalipeet is another flatbread that is flattened by hand. It is usually thicker and consists of a combination of flours. A collection of naan from different parts of the world. A collection of pita bread. Wraps and rolls are great on the go meals. Flatbreads of all types are used to make these. The sky is the limit when it comes to what can be filling in. The flatbread is spread out, the filling is added and the bread rolled up. This is my collection of wraps and rolls. A collection of different types of dhirdi. Dhirdi is a Maharashtrian crepe or dosa. Dhirdi are a great way to use up the flours in the house. Sodas and Floats are summer favorites. Smoothies are a quick way to get your meal on the go. Smoothies are delicious, nutritious and filling.